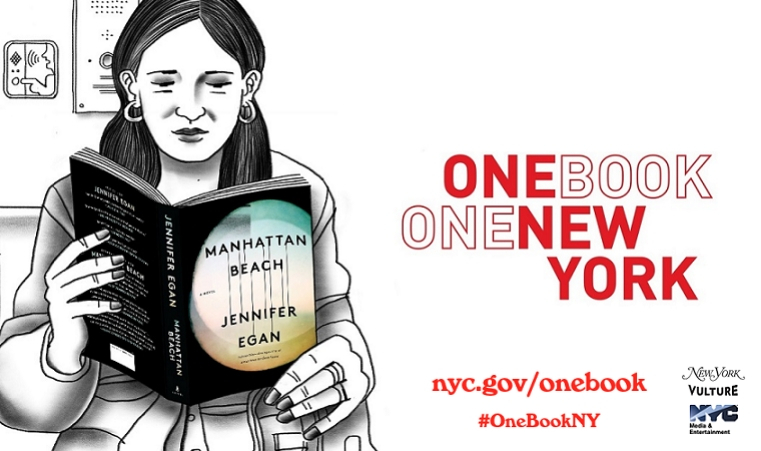 Manhattan Beach by Jennifer Egan, the English Department's Artist-in-Residence, was selected in April by New Yorkers as the 2018 One Book, One New York summer read. This is the second year of the program, launched by the Mayor's Office of Media and Entertainment. The citywide reading program engages New Yorkers to vote among five books for the one they all want to read together. As part of the program, Jennifer Egan participated in the PEN World Voices literary festival on April 19th, was featured at Vulture Fest in conversation with New York Editor-in-Chief, Adam Moss in May, appeared at the Strand Book Store as part of the Vulture Insiders Book Club in June, and joined NYU's School of Professional Studies for a lively chat with college students and would-be writers in July. To see video of the finale event as well as photographs from events and book clubs, visit the One Book, One New York page at www1.nyc.gov/site/mome/initiatives/1book1ny.page.